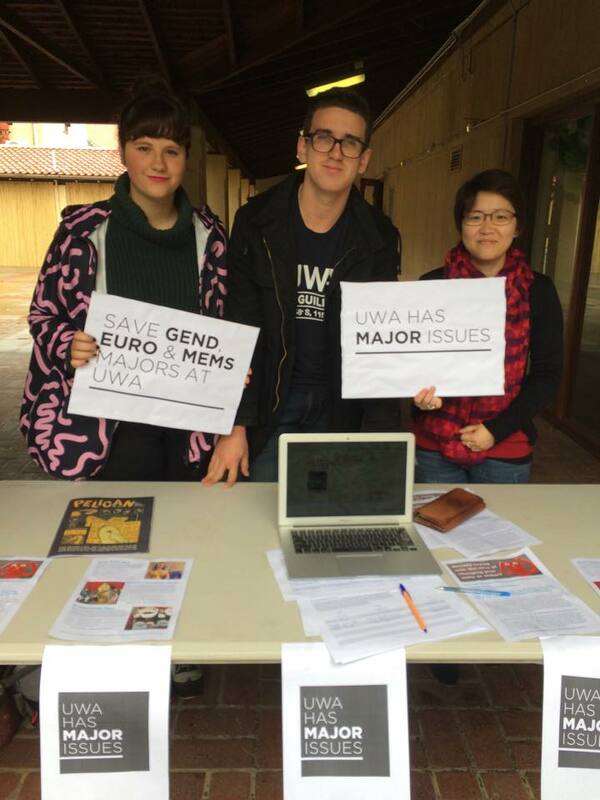 The leaders of the ‘UWA Has Major Issues’ campaign ran a stall during common lunch hour today to raise awareness about the Arts Faculty’s proposed rescission of its Gender Studies, Medieval and Early Modern Studies and European Studies majors. The proposal will be voted on when the University’s Academic Council meets on August 5. Women’s Officer Emma Boogaerdt and Education Council President Tom Beyer distributed information to curious students about the proposed cuts, and gathered signatures from those against the changes to present before the Academic Council. Boorgaerdt and Beyer were optimistic about the success of their petition, which has amassed over 300 signatures so far. The Gender Studies major at UWA has long faced an uncertain future, having been removed in 2011 and reinstated in 2012 following student protest. Those beginning their degrees in that year were still unable to enrol in the major, and enrolment numbers have continued to dwindle. She also expressed disappointment that the proposed decision to axe the majors had been made with limited student consultation, and without the Faculty providing a clear justification. She said that the proposed removal of the three majors “fails to take into account their academic value, and the prestige that they bring to UWA”. UWA is the only university in the state to offer any of the three majors currently under threat. You can view the ‘UWA Has Major Issues’ official Facebook event here, or sign the petition here.